The world of sports nutrition can be quite daunting – there are so many different products, brands and varieties to choose from. 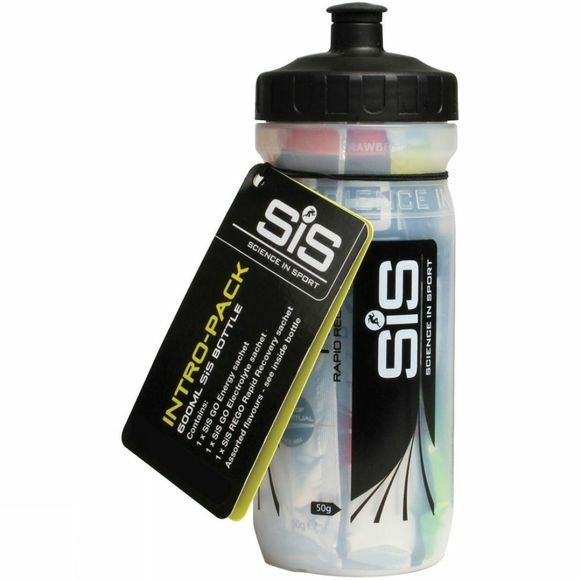 So to make it as simple as possible, SiS have put together the Training Supplements Intro Pack. It contains three iof their most popular products, as well as a 600ml bottle for mixing your drinks in. Go Energy Sachet Lemon: Carbohydrate mix (96%) (maltodextrin (produced from partial hydrolyses of a special variety of maize), fructose), natural flavouring, citric acid, sweetener (aspartame). Contains a source of phenylalanine. Go Electrolyte Sachet Lemon and Lime: Carbohydrate mix (92%) (maltodextrin(produced from partial hydrolyses of a special variety of maize), fructose), natural flavouring, citric acid, electrolytes (2%) (sodium chloride, calcium lactate, potassium chloride, sodium citrate, magnesium lactate), sweetener (aspartame). Contains a source of phenylalanine. Rego Rapid Recovery Sachet Chocolate: Carbohydrate mix (46%) (maltodextrin (from maize), fructose), protein (46%) (soy protein isolate), electrolytes (3%) (sodium chloride, potassium chloride, calcium lactate, magnesium oxide), natural flavourings, L-leucine, emulsifier (soy lecithin), thickener (xanthan gum), colour (beetroot red), vitamins and minerals (ascorbic acid, nicotinamide, alpha tocopheryl acetate, ferric pyrophosphate, zinc sulphate, calcium pantothenate, pyridoxine hydrochloride, riboflavin, thiamin mononitrate, calcium citrate, folic acid, potassium iodide, biotin, vitamin D3, cyanocobalamin), sweetener (sucralose).